Have you ever wished that you could trade your apartment & crappy office space for a floating live/work houseboat in the San Francisco Bay? I know I have. A few years ago, The New York Times published a piece about which refuelled my hope that one day, those houseboat dreams could actually come true. The inspiring article featured Olle Lundberg; a modernist architect who works with salvaged industrial materials. Lundberg is one of our favorite architects, and his designs never cease to amaze and inspire us. 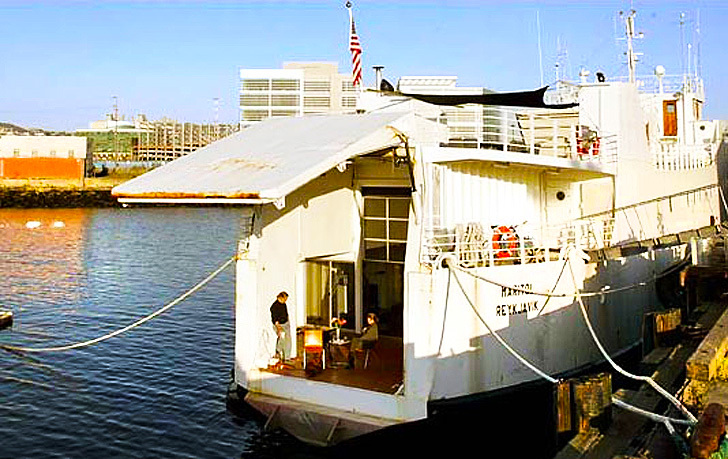 This floating live/work space was built from an old car ferry that he found in Iceland, shipped through the Panama Canal, and docked at a pier in the Mission Bay neighborhood. Lundberg’s design firm had been looking for a vacant industrial building in San Francisco that they could renovate, but despite the dotcom crash, they couldn’t find anything suitable. “I’d seen tugboats that had been converted,” Mr. Lundberg said, “so I thought, ‘What about a small ship?’ ” An online search lead him to the Maritol, which was built in 1975, and was listed for $260,000. The ship has two floors: the open-space bedroom is above, and the dining room—complete with a salvaged wood dining table—sits below water level. The dining table was fashioned out of an 18-foot-long slab of cypress left over from the Slanted Door, a popular Vietnamese restaurant Mr. Lundberg designed in the newly restored Ferry Building. It was originally purchased for the restaurant from the Urban Tree Mill; a nonprofit group based in Oakland, Calif., that recycles trees removed during street improvements. 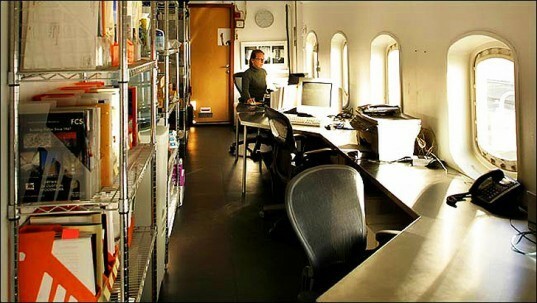 Lundberg and his wife no longer live on the ferry, but it’s still being used by creatives in search of an inspiring, unique space in which to work. Creon Levit and Brewster Kahle purchased the ferry from Lundberg a few years ago, and transformed it into a co-working office where everyone from start-up entrepreneurs to freelancers sit together while they work. The dining room table remains in place, as it’s now a communal table for those who rent workspace there. >If you happen to be interested in building your own residence or office space, a New York Times article entitled The Scavenger’s Guide to the Galaxy has an excellent list of resources for finding quality salvage materials. I'm getting very interested in doing something on the same lines. My question is: how much to dock something like this? Or how much to moor?